The Football Association (FA) delivered a world first by deploying virtual-replacement bechnology on the LED perimeter signage to target different worldwide broadcast audiences in its recent international match against Costa Rica. The deployment during England’s FIFA World Cup warm-up game played at Elland Road stadium in Leeds last week was the first time anywhere in the world that this LED-driven technology has been in full live commercial use in international football. The FA is the latest football organization to begin working with virtual-signage–insertion technology from Supponor. 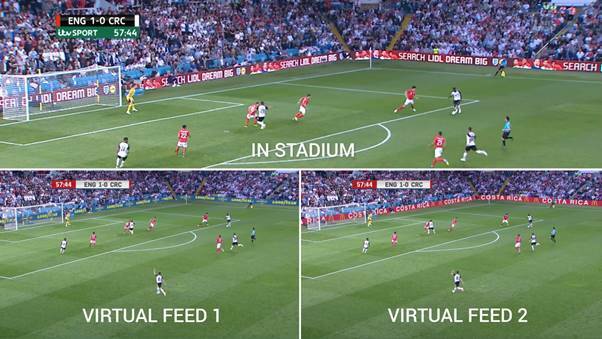 The potential for virtual-replacement technology is substantial, according to FA Senior Broadcast Manager Tom Gracey. Through the use of this virtual technology, the advertising seen on the LED perimeter boards in the broadcast coverage was completely different in the targeted territories from the messaging displayed to fans in the stadium and across ITV’s domestic coverage and the world feed. The successful implementation of the virtual feeds was delivered for the FA by domestic-rights holder ITV in partnership with Supponor and stadium-technology specialists ADI. The virtual-LED solution, installed at Elland Road last season, is the product of a partnership in which Supponor’s virtual-advertising replacement is integrated with ADI’s digiBOARD technologies and is now rolling out further across top-tier sports markets. Commercial rights were managed by UK-based sports-media–production company Interregional Sports Group. ISG secured the rights to deliver the virtual perimeter advertising for the game and commercialized two concurrent virtual feeds, one delivered to the Americas and the other to Asia, Australasia, and parts of Europe. Supponor CEO James Gambrell says the work his company has done with the FA follows a number of significant developments, including approval of the system for use in Germany’s Bundesliga as of next season. For that deal, Supponor has been working with Sportcast, the production provider for Bundesliga. ADI CEO Geraint Williams, whose company is the UK market leader in perimeter-LED technology, says the FA has shown real leadership in its keenness to explore virtual advertising.